It was a kit. But it was cheap and I liked it so I bought it. The kit had everything but the interfacing and thread. And it seems to be good quality. I went along, following the enclosed directions. But there were two things I kind of questioned. First there were no pockets inside. Well I like a couple pockets so I added pockets to the lining. Easy enough. Then they had you put in the lining before you put on the fringe. That didn't make a lot of sense to me, but I decided to go ahead and do it their way. Well, I put in the lining -- with pockets. After I added the fringe I looked on the inside I had sewn the pockets shut!! I like the style and may do it again but I will put the trim on before the lining! The moral? Trust your instincts. Nothing like a razor blade to remedy that problem! Its very cute though, even with fake inside pockets, LOL!!! PM me with your email and I'll tell you how to do it. It was easy. I like the bag, very nice. I know I have done the same thing too, so I trust my knowledge base more. Nice bag! I know I always get into trouble if I don't trust my gut!! 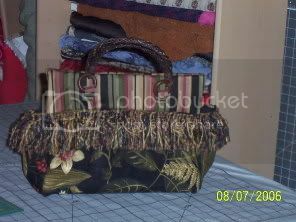 Seems like fabric purses are the thing right now. I've been make quite a few and it's so much fun. My 15 yr old granddaugher loves her pink paisley one. All her friends want one like it. We've told them no way that it's an original one of a kind. Besides, you know 15 yr old girls, they're best friends one minute and sworn enemies the next. I think I am going to make some for family Christmas presents. With my sisters, aunt, nieces and girlfriends/wives of nephews there will be about 10 females at my house Christmas Eve so I plan to make up dozen or so bags give them each one with permission to swap if it's not to their liking. I figure the swap neogiations will be more interesting than the bags. Or you could lay them all on the table and watch them fight over who gets what. I think "Dirty Santa" would be a great way to go with the bags. Very cute bag Dorothy. I love the colors!! And who needs pockets anyhow? Even if I have pockets, everything just ends up at the bottom. I really like it... colors are great!